We’re often curious as to how others see us. 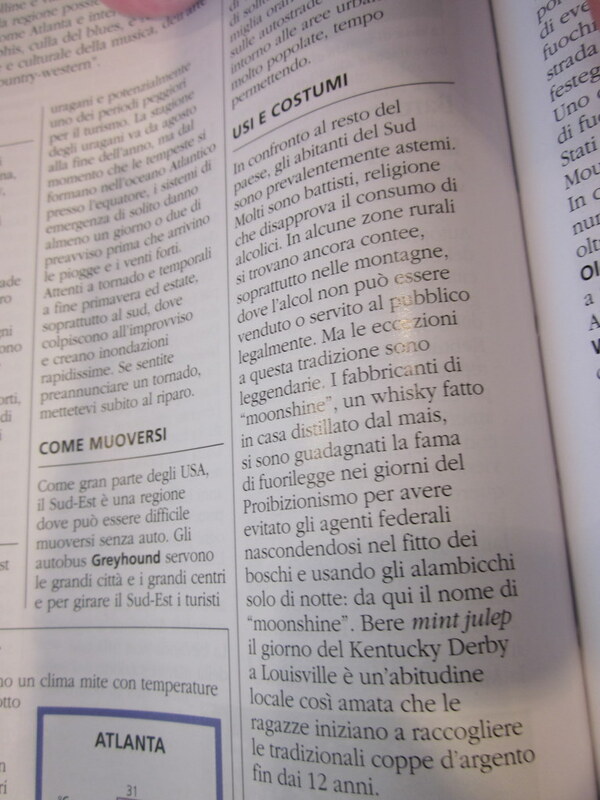 To that end, today’s offering is composed of translations from an Italian guidebook to the USA on my home state and city. Factually, it’s largely accurate, with a couple of exceptions (the Louisville Falls Fountain was scrapped 13 years ago), but the amusement for Louisvillians and Kentuckians should come from the nuance. Largely, the Italians give the Commonwealth high marks for natural beauty and traditional culture. Coming from Italy, that’s a high compliment. 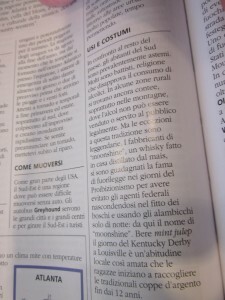 Upon closer inspection, the book is actually the Italian translation of a UK-published volume, DK Publishing’s USA Eyewitness Travel Guide. Well, although not Italian, it is still foreign, so the basic premise remains, but it’s less fun. With its passages through the Appalachians and hilly pastures where horses run through acres of bluegrass, Kentucky is one of the most picturesque states in the country. The land in the west is mountainous, and was at one time inhabited by Indians who forcefully resisted settlements of the white colonists. Today Kentucky is known all over the world for its horses and in the area around Lexington you can find many thoroughbred farms. 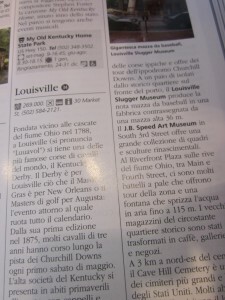 One of racing’s most prestigious events, the Kentucky Derby, takes place in Louisville. 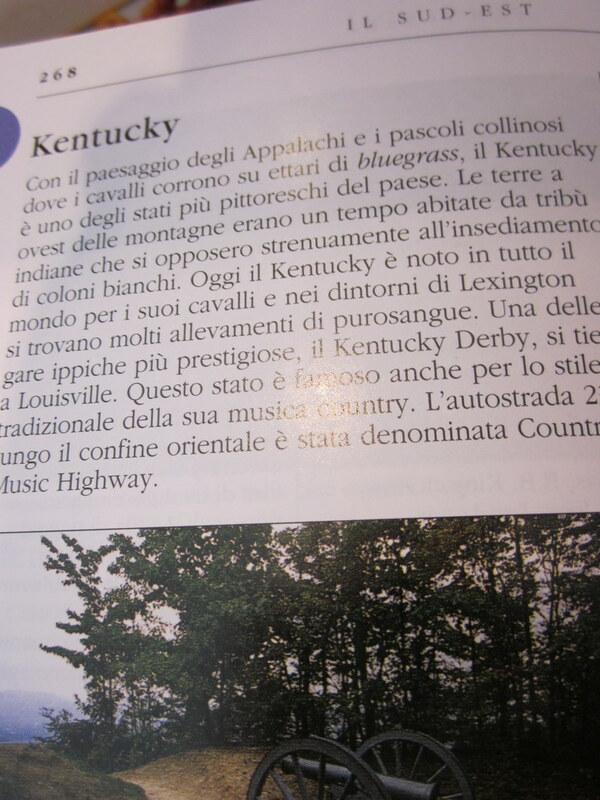 The state is also famous for its traditional style of country music. Highway 23 along the eastern border of the state is nicknamed Country Music Highway. 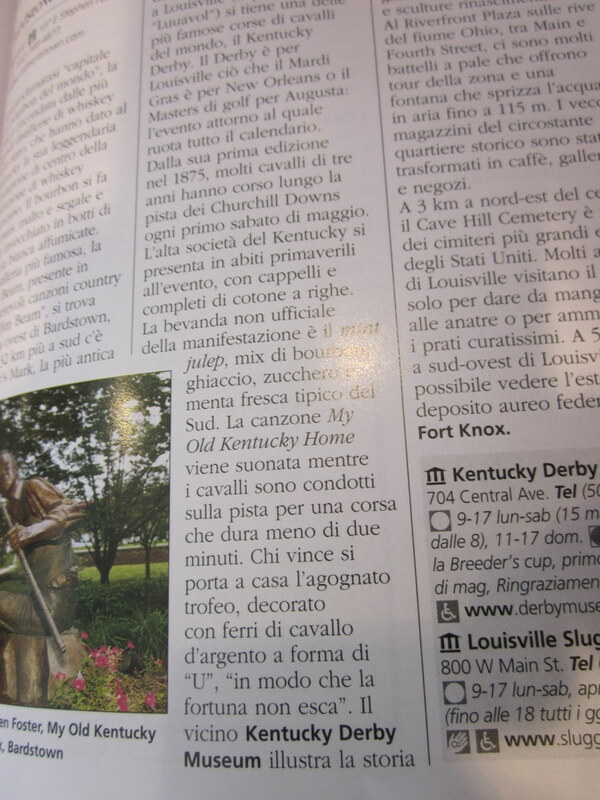 The nearby Kentucky Derby Museum shows off the history of horse racing and offers a tour of the racetrack Churchill Downs. A couple of blocks from the old downtown by the riverfront, the Louisville Slugger Museum produces the noted baseball bat in a factory marked by a 36-meter-high bat. The J.B. Speed Art Museum on South 3rd Street offers a grand collection of paintings and Renaissance sculpture. At Riverfront Plaza on the banks of the Ohio River, between Main and Fourth Streets, there are many paddlewheel boats that offer a tour of the area, and a fountain that sprays water 115 meters in the air. The old warehouses that surround the old downtown have been changed into cafes, galleries and stores. Three kilometers to the northeast of downtown is Cave Hill Cemetery, one of the biggest cemeteries in the United States. Many Louisvillians come just to feed the ducks or to wander on the well-kept lawns. Fifty kilometers southwest of Louisville you can see the federal gold deposit at Fort Knox. Like the Mississippi Delta is for the blues, the strip of eastern Kentucky(along with West Virginia) has one of the biggest concentrations of country music artists in America. English, Irish and Scottish immigrants brought with them their ballads, rhythms and Elizabethan instruments, which they used to create a typically American style now called “country,” characterized by rapidly-played violins, an occasional yodel and lyrics about the hard life in the southeastern United States. Highway 23, which goes from Ashland to Pikeville along the eastern border of the state, is nicknamed the “Country Music Highway” to commemorate the number of musicians born along it. The road passes though the birthplaces of Billy Ray Cyrus, Loretta Lynn, Patty Loveless and Dwight Yoakam. The great fields of Kentucky bluegrass inspired a particular kind of country music that bears the same name, which comes from a kind of music played at the end of the ’40s by Bill Monroe and his Bluegrass Boys. The name bluegrass stuck and this style of acoustic folk music is quite popular in the region. 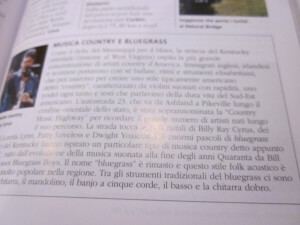 The traditional bluegrass instruments are the guitar, mandolin, five-string banjo, bass and Dobro. Compared to the rest of the country, inhabitants of the south are predominantly teetotalers. Many are Baptists, a religion that disapproves of the consumption of alcohol. In some rural regions, one can find counties, mainly in the mountains, where alcohol cannot be sold or served to the public legally. But the exceptions to this tradition are legendary: producers of “moonshine”, a homemade whisky made from corn, earned their fame as outlaws in the days of Prohibition by hiding from federal agents in the depths of the woods and using their stills only at night – thus the name “moonshine.” Drinking a mint julep on Derby Day in Louisville is local tradition so beloved that local girls begin collecting the traditional silver cups starting at age 12. 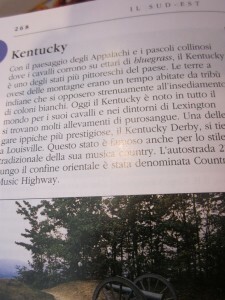 This entry was posted in america, italy, kentucky and tagged bluegrass, coast-to-coast, country music, derby, falls of the ohio, italians in the USA, kentucky, louisville, louisville slugger, moonshine, roadtrips, whiskey. Bookmark the permalink.